Manchester United caretaker boss Ole Gunnar Solskjaer has urged goalkeeper David de Gea to follow in the foot steps of Anthony Martial and sign a new long-term deal. Martial was recently convinced into penning a new contract after an extended run of negotiations when it previously looked like he could part ways with the club in the summer. With the Frenchman's future assured, the club have shifted their attention to committing De Gea to a long-term deal and speaking to reporters, Solskjaer has acknowledged the importance of keeping hold of the Spaniard. "The club's working on a few players. I don't know how far we are, but it's a statement from the club we want to keep our best players." he was quoted as saying by Goal.com. 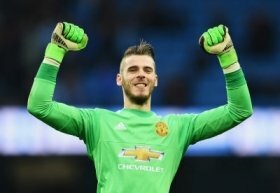 De Gea has made nearly 350 appearances for United in the past seven-and-a-half seasons and this has involved more than 100 clean sheets including one during the hard-fought 1-0 win over Leicester City on Sunday.